How can you Officially get Divorced in Singapore? 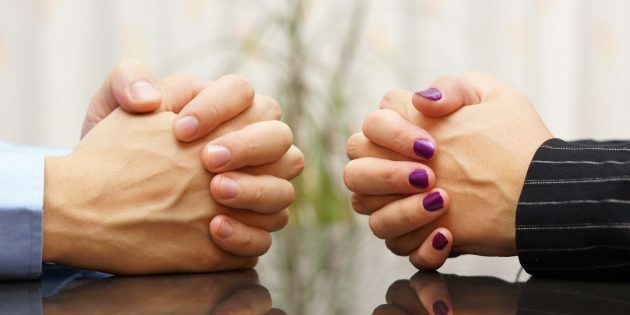 Regardless of whether you’re planning on having an uncontested divorce or a contested divorce in Singapore, you should know that there is only one true ground for divorce in Singapore, which is an irretrievable breakdown of marriage. This is stated specifically in Section 95(1) of the Women’s Charter. Either party to a marriage may file a writ for divorce on the ground that the marriage has irretrievably broken down. You may be wondering why this is the case. After all, when divorce lawyers and their clients talk about divorce, they tend to talk about adultery, desertion or unreasonable behaviour. It’s easy to get confused here and most laymen do. These terms represent the facts that lead to an irretrievable breakdown of the marriage, and these facts can be found in Section 95(3) of the Women’s Charter. (e) that the parties to the marriage have lived apart for a continuous period of at least 4 years immediately preceding the filing of the writ. Who can get a Divorce in Singapore? If you’re a Muslim, or were married under the Muslim law, then you won’t be eligible to get a civil divorce. In this situation, you’ll have to look towards the Syariah Court. have lived in Singapore for at least three years before applying for a divorce. Now, before we move onto the facts that can lead to an irretrievable breakdown of the marriage in Singapore, you should know there’s just one more tiny catch before you can get divorced in Singapore. Even if you feel that your spouse has morphed from a regular sweetheart into a wild-eyed hellspawn overnight, you still have to be married for a minimum of three years before you can get divorced in Singapore. This is set out in Section 94(1) of the Women’s Charter. Let’s take that back. While there is a three-year time bar for divorce, if your spouse has turned into a real hellspawn overnight, there may still be a chance you can file for divorce. Unfortunately, you’ll have to prove that you’ve suffered exceptional hardship or that your spouse has been exceptionally depraved and this isn’t something that easy to prove (Hellspawns tend to be quite sneaky about these things). The facts that lead to an Irretrievable Breakdown of Marriage. 2) The Plaintiff spouse must find it intolerable to live with the Defendant. If the Defendant isn’t willing to admit anything, proving adultery isn’t as easy as you may think. Clandestine Whatsapp messages (unless the content is damning) and late nights out don’t count for much in a court of law, and you may have to hire a private investigator to get concrete proof that your spouse is cheating on you. This tends to be the most common fact in which most divorces in Singapore are founded on. Here, it has to be shown that the Defendant spouse has behaved in such a way that the Plaintiff spouse cannot reasonably be expected to live with the Defendant. It’s usually a lot easier to demonstrate unreasonable behaviour (which is probably the reason why it’s the most popular fact to rely on). For example, the examples of clandestine Whatsapp messages and late nights out above may not be strong enough evidence to prove adultery but it may be enough to demonstrate unreasonable behaviour. Desertion and Living apart tend to be less common grounds for divorce in Singapore but these situations are still frequent enough to be worth mentioning. Desertion implies an abandonment against the wishes of the person claiming the fact and occurs when the Defendant spouse has deserted the Plaintiff Spouse for a continuous period of at least two years immediately preceding the filing of the divorce. 2) an intention to desert. There are two forms of living apart for the purposes of divorce. 2) Living apart for four years. The main difference between the two is that the Defendant spouse’s consent is required for “Living apart for three years”. The term “living apart” sometimes causes confusion among laymen, who can’t distinguish between “living apart” and “desertion”. The difference is the mental element. Living apart constitutes spouses living separately and this arrangement is by choice (the mental element of one or both spouses). While having completely separate living arrangements would definitely help, it is possible for parties to live under the same roof but still be considered to be “living apart” if they are sleeping in separate bedrooms and keeping separate households. Oh, there’s one last thing to take note of. 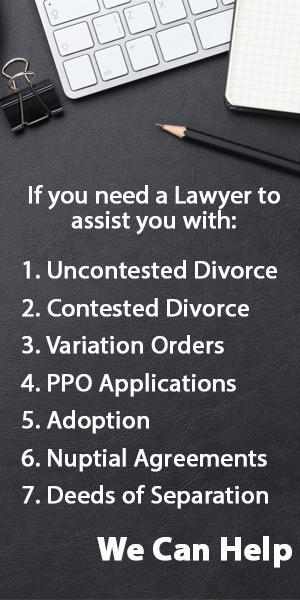 The circumstances of the divorce must make it “just and reasonable” to grant a divorce. Under Section 95(4) of the Women’s Charter, if it appears to the Court that in all the circumstances it would be wrong to dissolve the marriage, the Court shall dismiss the proceedings. In considering whether it would be just and reasonable to grant a judgment, the court shall consider all the circumstances, including the conduct of the parties and how the interests of any child or children of the marriage or of either party may be affected if the marriage is dissolved, and it may make an interim judgment subject to such terms and conditions as the court may think fit to attach; but if it should appear to the court that in all the circumstances it would be wrong to dissolve the marriage, the court shall dismiss the proceedings.